The demise of Apple's Steve Jobs made headlines when it happened. And since then, there have been so much written about him that has never been done so in internet's history. No doubt he was a visionary, inventor and a mentor. No less than 323 Apple patents list Jobs among the inventors responsible for them. 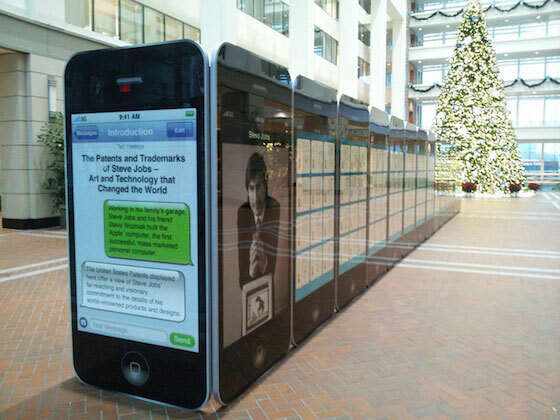 Now the U.S. Patent and Trademark Office (USPTO) is honoring the Apple founder with a dedicated exhibit. The Patents and Trademarks of Steve Jobs: Art and Technology that Changed the World puts Jobs’ patents on display in the USPTO’s National Inventors Hall of Fame and Museum. Conceived by the nonprofit Invent Now, the exhibit has a look that’s instantly recognizable: 30 giant-size iPhones, lined up screen to screen in a simple rectangular formation, like a military salute designed by Jonathan Ive.